We’re joining in the celebrations which revolve around John Muir’s birthday, Saturday 21 April 2018, with a free bike hire offer. John Muir was born in Dunbar, devoted his life to the environment and was an early advocate for the preservation of wild places. It’s fitting since we share a home town with John Muir and to pay tribute to his pioneering, conservation legacy, that we annually honour the John Muir Day celebrations. You can explore John Muir’s home town of Dunbar and the natural environment through our one day’s free cycle hire offer during the celebrations. 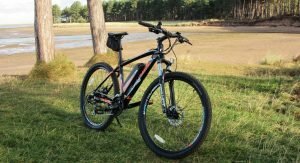 This includes electric bike hire on any day between Saturday 14th April and Sunday 22nd April 2018. More info regarding our hire service can be found on our Hire page. By bike, you could visit John Muir’s Birthplace, a museum devoted to his life, explore the environment of Dunbar which inspired John Muir as a young boy or head out to cycle the trail named after him, the John Muir Way, which heads west from Dunbar. For more information or to book a hire, call us on 01368 860300, email [email protected] or pop into the shop.